An amazing quarterback at Notre Dame, Tony Rice finished with an incredible 28-3 record for the Irish. When the nation was in full bloom love the Notre Dame football during the late 80’s, if Rocket Ismail gracing the cover of Sports Illustrated, they were talking about Rice’s ability to come alive and win games with his will and sheer athleticism. During that period, Tony led the Irish to the National Championship in 1988 and narrowly missed one in 1989. The college ranks were a completely different animal back then. Players weren’t scouted and groomed for NFL success like they are today. Rice was looked down on by scouts because he was an option quarterback with great rushing stats, but not so amazing passing stats. He did not get drafted in 1990, so Tony played in the CFL for the Saskatchewan Roughriders. Unable to crack the lineup behind starter Kent Austin, Rice elected to join the WLAF in 1991. Drafted by the Barcelona Dragons, the league attemped to lean on the Dragons to trade Rice to the Knights, because he was still popular in the states, but Barcelona refused. In the meantime, he’d split time with Scott Erney as the team rolled to World Bowl I against the London Monarchs. During the season the Spanish translation of his name became quite popular and he was referred to in the media as ‘Antonio Arroz’. Again, much like his time at Notre Dame, Rice would demonstrate his ability to wreck opposing defensive gameplans with oppritune scrambling. He’d rush for 210 yards and 2 TDs in 33 carries. 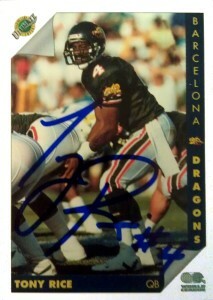 The Dragons finished as European Division Champs in 1992, but lose to the eventual World Bowl Champion Sacramento Surge. While the WLAF would reorganize after the season, Rice decided to hang around in Europe for an additional season, playing for the Munich Thunder of the Football League of Europe. At the time of the league’s suspension, Tony was the leading rusher in WLAF history, at the quarterback position. He worked for the Notre Dame “Blue and Gold” magazine publication for a few years, and I had heard rumors through the grapevine as to where he was at. Currently he’s with HUB International. Cross referencing with other sources I was able to peg down his actual location and shot these cards out to him last year. After failing previously in 2011, I was gunshy about giving him another shot, but when it comes to TTM autographs, -with no risk, there is no reward. I was pretty happy to get this one back with a small note inside “Apologizing for the wait, Your Friend, Tony Rice”, and the two autographed cards.